Our ambassador during the Warsaw Innovation Days! 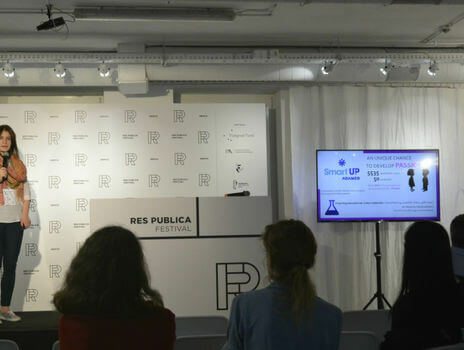 As part of Warsaw Innovation Days, the Res Publica Festival took place on 25 and 26 June, during which the challengers of the New Europe 100 list gave their speeches. It is a prestigious list of outstanding leaders in innovation in Central and Eastern Europe (CEE). The New Europe 100 rewards outstanding individuals and teams that are active in various fields: business, science, technology, media, politics and art. Among them is Joanna Jurek – ambassador of the ADAMED SmartUP programme. In her speech, Joanna talked about her research in transporting medicines with the use of nanofibers and “cellular origami” she is currently working on. It should be noted that Joanna is only 19 years old! Moreover, our ambassador aroused interest with her non-research activity, explaining how the ADAMED SmartUP programme operates. Her lecture was warmly welcomed and the listeners felt inspired to ask additional questions during her presentation.